It has become a bit of a tradition each year for me to record a Christmas tune. It's partly because I love this time of year, and partly as a gift to you for your support of me and my music. This year I decided to try an a cappella version of one of my favorites - O Holy Night. It was fun because the arrangement started with an idea then grew organically in the studio one voice at a time. I hope you enjoy it, and as always, thank you! I hope you have a wonderful holiday season. Great News for "Turning Thirty, The Musical"
I wanted to share some exciting news about my musical about my experience with cancer. Earlier this year, I partnered with Anne McSweeney of CEU Concepts to create a unique educational event for health professionals about cancer survivorship. I perform my show, then several of us do a panel to discuss and answer questions about the human experience of cancer. Nurses and social workers receive CE credits for participating. The event was a huge success, and what's more, our event has been accepted to be featured in San Diego in March at the World Congress On Continuing Education Development! The Congress is the preeminent international meeting of practitioners and researchers concerned with improving the continuing education and professional development of health professionals. Hundreds of people from around the country and the globe come to find new ways to develop their healthcare staff. We're both very excited to see where this could lead! Finally, I continue to perform, and have been busy writing and recording. I have two projects in the works, and plan to release some new material in the new year. I'll keep you posted on it's progress. Thanks, as always, for supporting me and my music. Have a wonderful holiday and new year! I love this time of year. There's a renewed focus on family, generosity, joy, and wonder, and to me, the feeling in the air is palpable. True, we sometimes get wrapped up in the more superficial aspects, but it seems even those often stem from nobler sentiments. So each year I like to do something artistic, something that hopefully captures a bit of what I value about the holiday season. And this year, I tried something a little unusual that combined several of my passions - music, technology, and almost a mathematical or scientific experimentation. In the process, I tried to maintain a respect for the old with a nod to the new. 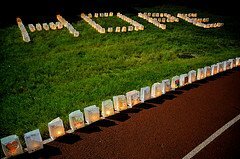 This month's download is a song about the Luminaria ceremony at the American Cancer Society's Relay For Life event. It was mostly written by my friend Jack Storey - it was his words and his ideas for the music that I had the privilege to work with and complete. He was kind enough to offer me co-writing status for my contribution, but I am just honored to be associated with the song and the event. My Audition for NBC's "The Voice"
On Friday the 18th, a friend at work (who shares my love of the musical Les Miserables) popped up on my screen in an instant message. "Will you be skipping out at lunch to audition for The Voice?" to which I honestly replied, "I didn't know about the auditions." He kindly finished with "I'd vote for you no matter what." 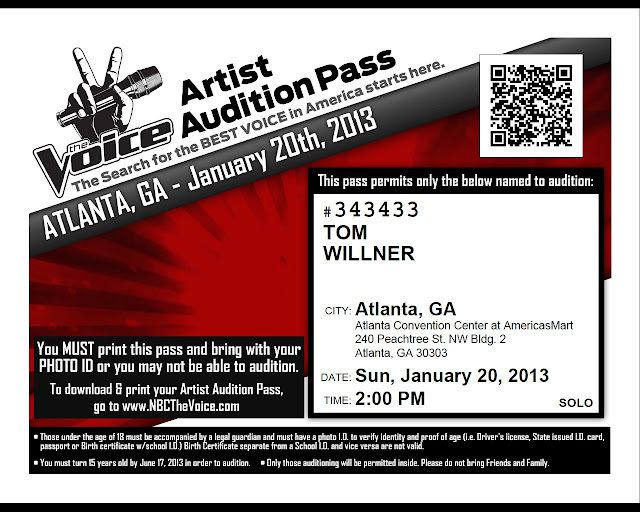 So I asked Google about it, and sure enough, Google informed me that NBC was indeed holding auditions for The Voice in Atlanta that weekend. I researched what you needed to do to sign up, then debated with myself about whether or not to audition. I talked it over with my family who all encouraged me to go. I am a technology director at Georgia State University, a musician, a testicular cancer survivor, and a runner.